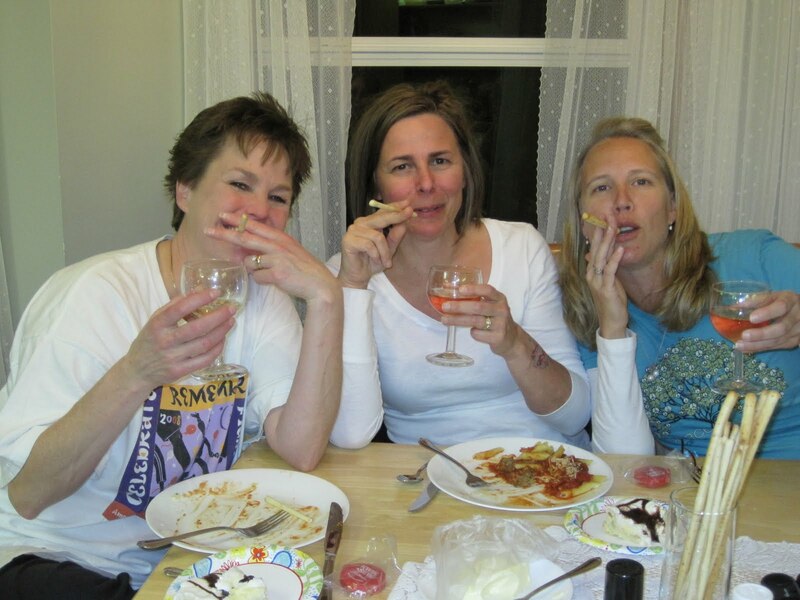 What a wonderful time we had with Kaye. 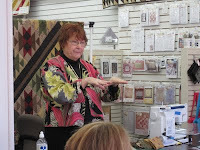 She made us laugh, she showed her beautiful quilts, and she helped us learn smart piecing techniques. I love that a portion of the sales of her rulers goes to Susan G. Komen research. Thanks Kaye! 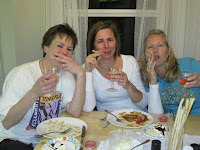 I just had to publish a few more photos! Have you heard about the wonderful Kinkame fabrics coming from Japan? The Clothworks Fabric company has been working with designer Reiko Kato to bring these to us, now available here! These are not your typical geisha girl designs, but the very soft and subtle hues that have been a signature of fine Japanese fabrics. Shades of taupe, grey, rose, green and brown all combine to give a very sophisticated look. The prints feature tiny flowers and geometric designs. The textured yarn-dyed wovens are exceptional. We have the European Taupe II collection on hand and have ordered the European Taupe III group. Debbie just finished making a great small quilt from this fabric, this pattern is Appomattox by Blue Underground. Well, the binding isn't done yet, but "finished" is a relative term open to interpretation! It will be on display very soon! 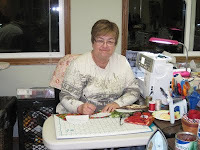 If you visit the Clothworks website, you can view the fabrics and even download some free patterns. 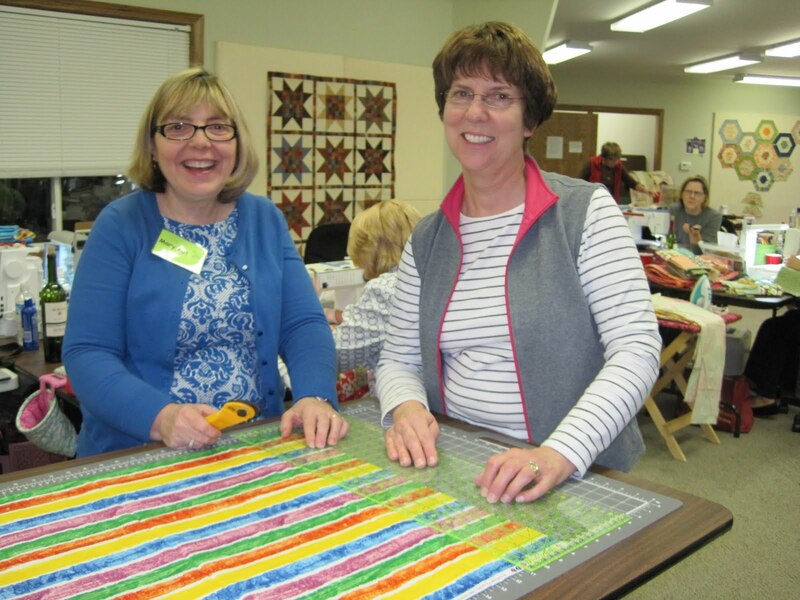 I quilted this project for Debbie and it is an example of a good use of a simple all-over design that I like to use instead of the usual meandering design. 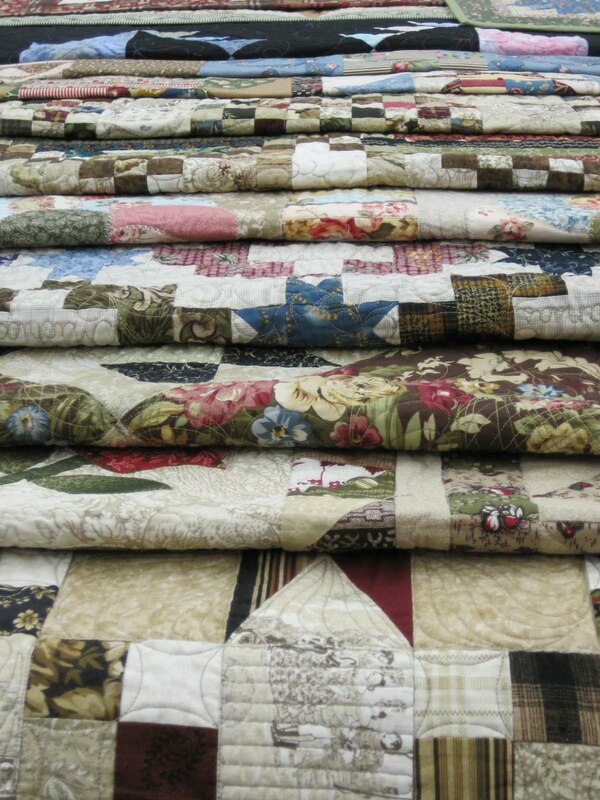 Actually, this quilting design is kind of ingrained in my brain now because it is what I used on the miles of tablerunners that I made for my daughter's wedding earlier this month! 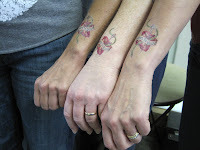 And here's a little teaser for you--if we can make it work, we hope to have Reiko Kato here in our store in the spring! No confirmed details yet, but this would be a very special event not to be missed! We are so very proud of 15 year old Mikayla and 11 year old Elise! 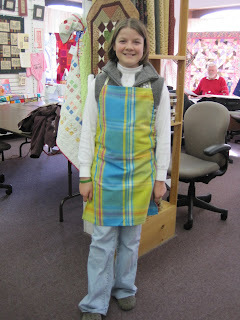 Mikayla came to the shop with her grandmother Marion ( a great customer!) 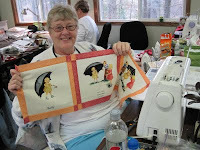 and picked out these great fabrics for her quilt. 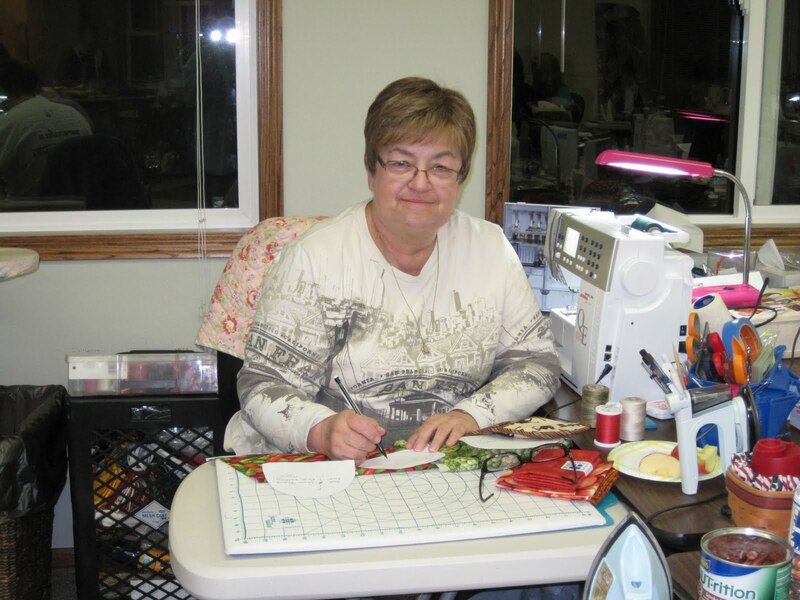 She sewed it up, entered it in the fair and won a ribbon! 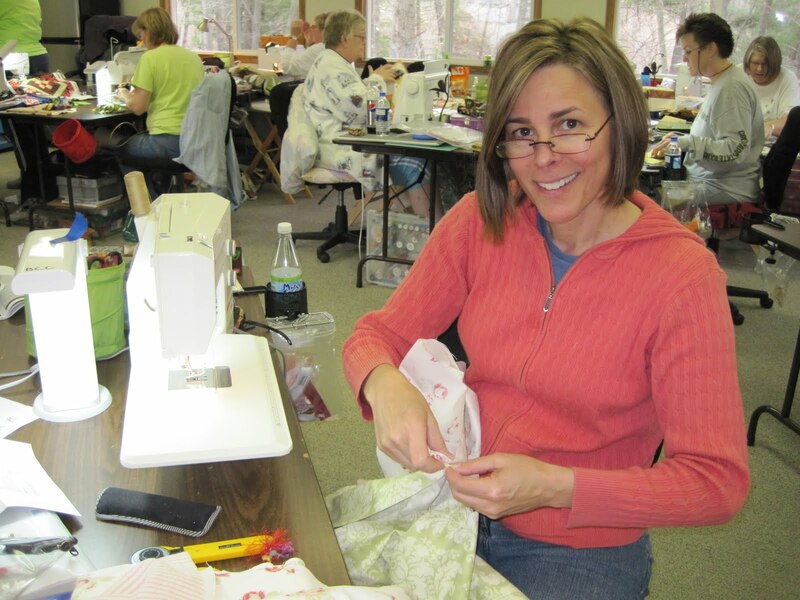 11 year old Elise sewed her capris while taking our Kids Sew Camp this summer with Jeanne. Elise and mom came back to the shop to pick out fabric for a matching top. 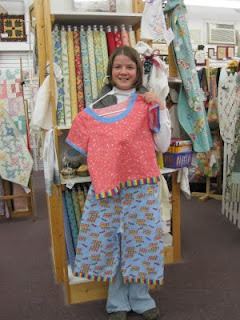 She entered her top and capris along with a quilt and afghan and won ribbons on all. Congratulations you two! 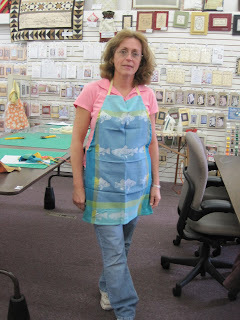 We had a great time sewing quick and easy aprons from tea towels. The project took all of ten minutes. The hardest part was choosing your towel! 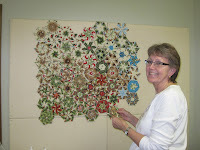 Join us every 3rd Friday of the month for other fun and easy projects. These make great gifts! We have prepared a bounty of beautiful handcrafted items for our silent auction now on display in the store and on the web--just click here to go to the website and then click on the banner about the Susan G. Komen fundraiser. You will find a picture of each of the 17 items, allowing you to participate in the auction even if you can't visit the store! Just call or email us and we will update you on what the current bid is and add your own bid to the list. Couldn't be easier! All the money collected goes directly to the foundation to help research and prevention of breast cancer. Don't hesitate! We need your help! We are excited to present our 2009 silent auction to benefit the Susan G. Komen Foundation to support breast cancer research. We have many donated items on display and we are ready to accept your generous bids! 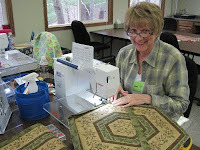 This is a fun and easy way to support the very important work of this organization and at the same time you can go home with some wonderful quilted goodness. We have a variety of sizes, styles and types to suit many interests, I'm sure there is something that will strike your fancy. Pictured above are a crazy quilt (pattern by Two Kwik Kwilters), the Bow Tucks Tote, My Paris Travel Bag by Fig Tree Quilts, a pinwheel tablerunner and a gorgeous silk dupioni quilt. Below is a darling tea cozy, Bubbly Babies quilt in blue and white, a set of embroidered accessories and a churn dash quilt. More pictures and information coming, I promise! Very important detail---bidding ends 10/31 at 5 PM! The Sale Wall is full! 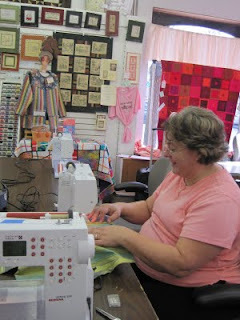 Lots of new fabric and nowhere to put it so we got our red pens out and marked down lots of fabric. These are great bolts for adding to your stash or for quilt backs. Come check it out! 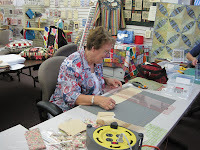 Making room for new fabrics is an endless challenge around here! Just when I think everything has a place of its own, our Man in Brown delivers more boxes, and we are like kids in a candy store opening up the flaps to peak at what's inside. This time it is 26 bolts of new Amy Butlers new line named Love. Lime, tangerine, periwinkle and turquoise are a few of the featured colors, very bright and cheery. It could probably help you make it through the winter to just have a bundle of these lovely fabrics to fondle when the going gets tough around mid-February! 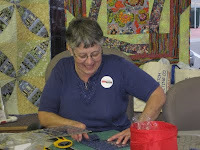 Also just received a good assortment of vinyl fabrics from Moda and some Kaffe Fassett prints. 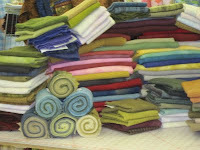 These are soft and supple, good for bags, bibs, book covers, tablecloths, or whatever your imagination can come up with! These are in addition to our ~20 designs of oilcloth in great prints with a retro/vintage style. Plenty of design possibilities! 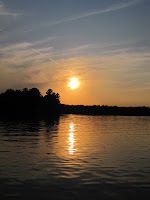 Just wanted to share photos of the sky during a sewing break. 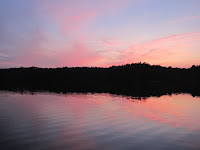 I was working on my quilt for the Silent Auction Breast Cancer window when I decided it was time for a pontoon ride. I would love to capture these colors in a quilt! I love hand dyed wool and we just got in lots of it from our dyer- Paulette. Look at all the yummy colors. Can't wait to start a new project! 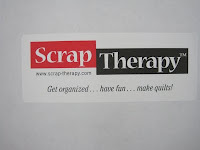 Laurel started a new class today- Scrap Therapy. 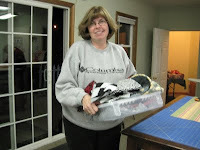 Everyone received a "scrap" bin and got busy organizing their scrap stash. 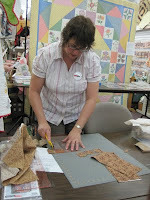 Scraps were cut into strips and squares with ideas given for projects. 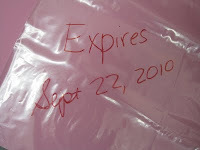 I love the idea of labeling a baggie with the following: Expires on (the date 1 year from now)! 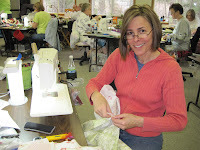 We have several more "cutting" classes schduled- come join the fun! 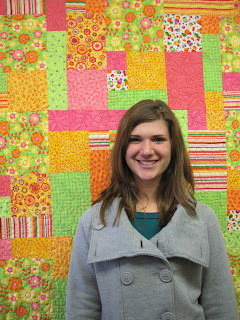 This quilter followed the pattern as written. 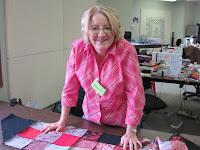 This quilter used the same red/pink fabric around each block, on each side of the floral strips, and in the narrow border. This quilter used an entirely different set of fabrics, chosen to coordinate with her home. Instead of the floral strips she used a strip of the border fabric with inset squares. This helped her tie all the colors together. 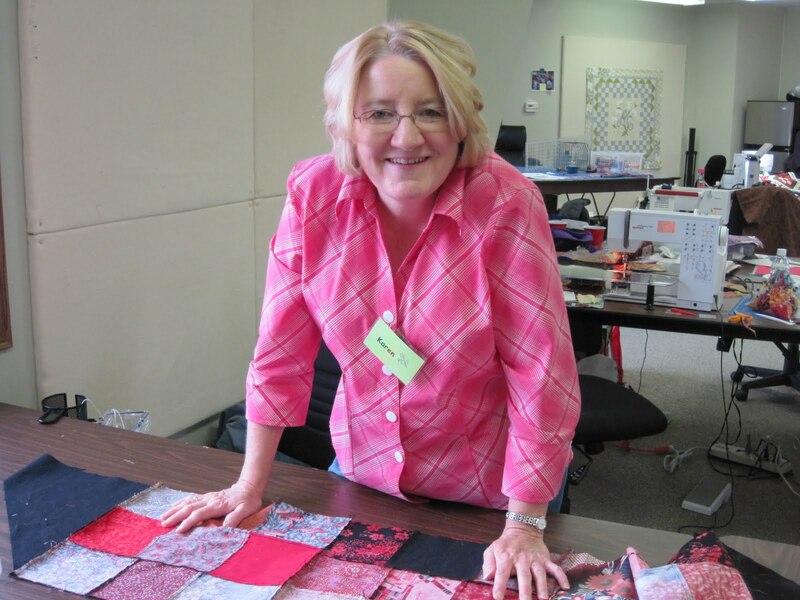 This quilter used the featured fabrics but a setting of her own design, changing the size and overall look even though the blocks are all the same. There were several more variations, but I included these to bring home the point that even though we all started out in sync, we all chose our own path to the end, and that is the joy of life! 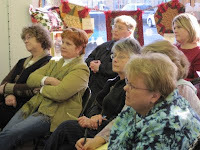 Our group is taking a hiatus until the new year and I'm working out a plan for something new for 2010. Stay tuned! We are loving these bright and colorful fabrics from Westminster/Rowan. 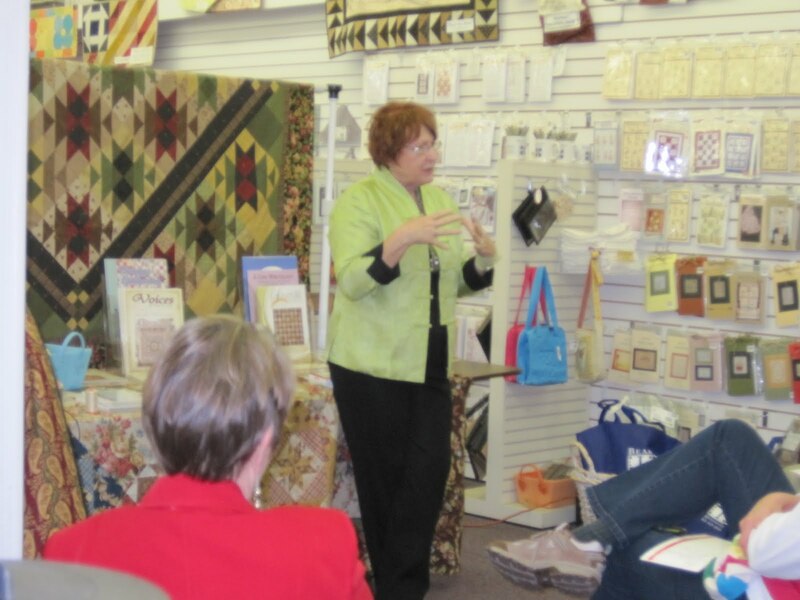 I have to admit that when I started quilting (back in the dark ages) I completely bypassed anything looking like this. But times have changes and so have I! 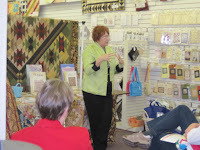 The fabrics have improved immensely, both in quality and style, with wonderful designers bringing art to my work. 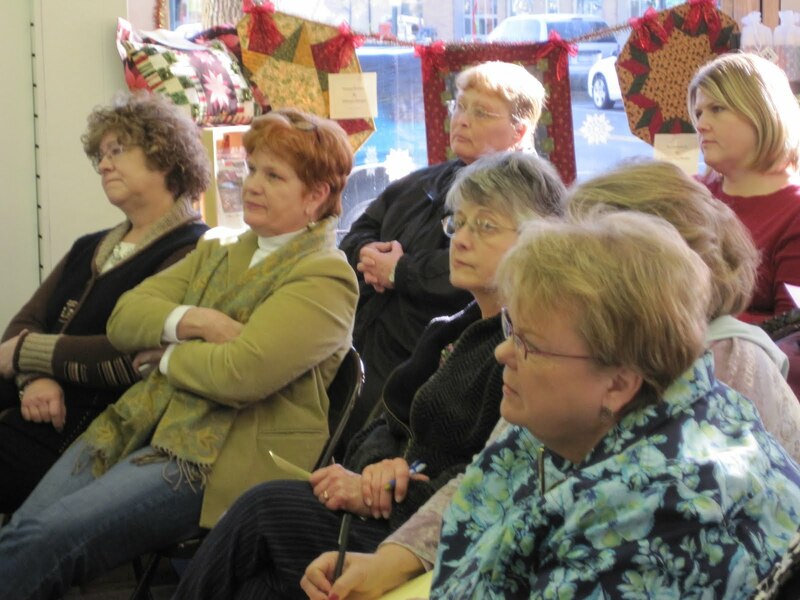 Sometimes I sense that customers are unsure of how they would incorporate the color and scale of some of these fabrics into a traditional quilt design. Let me tell you that it is, indeed, possible to cut them up into small pieces or just use them in big chunks. Both looks can turn into an amazing design when it is all put together. Just give it a try! We will be happy to help you select the best pattern and fabrics for your next work of art! We have recently received a large shipment of Kaffe and friends, so don't miss out while the shelves are full! 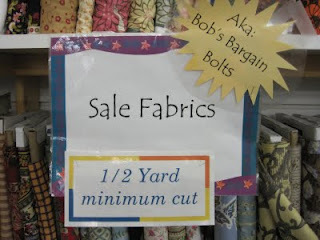 Do stop in, I think I hear some fabric calling your name! 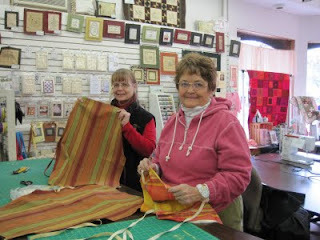 Plenty of time to work on projects for yourself and others--look for our newsletter soon with some classes aimed at gifts to make without a huge time investment.